PASADENA, CA--(Marketwire - April 30, 2008) - Spring allergies affect between 10 and 20 percent of Americans and where you live makes all the difference. The Spring Allergy Capital list released by the Asthma and Allergy foundation names Lexington, KY as the number one offender this year -- up from 52 last year! The list, now in its sixth year of publication, ranks the 100 most populous metropolitan areas in the United States, with those near the top deemed "the most challenging places to live with spring allergies." FeelgoodforLife.com, an online health resource for men and women over 50, finds Western support for an ancient allergy remedy -- the neti pot. A neti pot may be just what the doctor ordered. In fact Dr. Mehmet Oz, the prominent surgeon and health author, did just that on a recent episode of Oprah, explaining how nasal problems can be alleviated with the use of this simple natural remedy. Neti pots have been in use for over a thousand years. They are used to perform the ancient Ayurvedic technique of Jala Neti, which means nasal cleansing with water in Sanskrit. People have used this simple technique for many beneficial results including the prevention of colds, flu, sinus headaches, nasal dryness, breathing problems, coughing due to post nasal drip and allergy symptoms. It has even been said to get rid of bags under the eyes, and to improve smell, taste, and vision (as the neti pot also clears out the tear ducts). Dr. Bradley Marple, chairman of the rhinology and paranasal sinus committee for the American Academy of Otolaryngology -- Head and Neck Surgery, says nasal irrigation is a well-known remedy for various respiratory complaints. "Studies indicate that saline nasal irrigation is a highly effective, minimally invasive intervention for people suffering from nasal issues," explains Dr. Marple who is also a professor of otolaryngology at the University of Texas Southwestern Medical School. "There are many products that deliver saline solution to the nasal area, but the gentler pressure of neti pots is more comfortable for the ears." 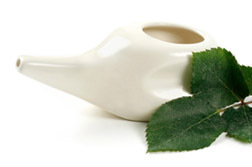 For more information on the neti pot and other natural heath news visit http://www.feelgoodforlife.com.